If you love riding bikes, you will know how important it is to keep it in shape to have the best experience. To have a smooth ride, you need to clean your bike regularly and conduct bike chain maintenance. From washing it regularly, to making sure the tires are inflated the right amount. Keeping your bike well-maintained is not a difficult task. However, if you ask what the most important thing is when it comes to keeping your bike well-maintained? It is the chain of your bike. The chain of your bike is perhaps the most important part of your bike. It is composed of hundreds of links, rollers and plates. There are moving parts in the chain that keep your bicycle moving around smoothly if they are kept well-maintained. Therefore, it is important to regularly maintain your bike chain so that it keeps moving around reliably and smoothly. The idea is to clean and lubricate the chain of your bike. Here are some simple steps you can use to maintain your bike. Put your bike in a work stand and lean it against a shelf or wall. This will allow you to rotate the pedals both ways easily. Now take a rag and give it a couple of folds. Spray a degreaser on it in a generousamount. Wrap this rag all around the lower part of the bike chain and hold it in place using your left hand. At the same time use your right hand to pedal the chain backwards. Holding the rag firmly will allow the dirt and grease to come off. However, it should not be so firm that the chain does not move. It is important to apply pressure alternately to the top, bottom and the sides. Remove the rag and reposition it so that a clean part of the rag is facing the chain. Repeat the process several times until you are satisfied with the cleaning of the chain. This might leave some dirt and grit on the inside of the chain in the small holes. If you want a more thorough cleaning, using a chain cleaning device is the best option. It is filled with a liquid degreaser, and the chain is placed inside the cleaner while the pedals are spun. There are several sets of brushes that work together to clean all the nooks and crannies of the chain and remove all the grease and gunk. Once the chain is cleaned, wipe it off and let it dry before riding the bike again. Keeping your chain well lubricated is the key to its long life and free movement. If you do not lubricate the chain of your bike regularly, you will not be able to have a smooth ride. To lubricate the chain, shift your bike to the middle gear and spray an ample amount of lubricant to the chain. The best lubricant for this purpose is a bike chain lube water based lubricant as it not only provides lubrication to the chain, but also allows it to remain rust free for a long time. Rust and corrosion reduce the life of your bike chain; hence it is important to invest in a lubricant that allows the chain to remain rust free. There are many options when it comes to a bike chain lubricant. 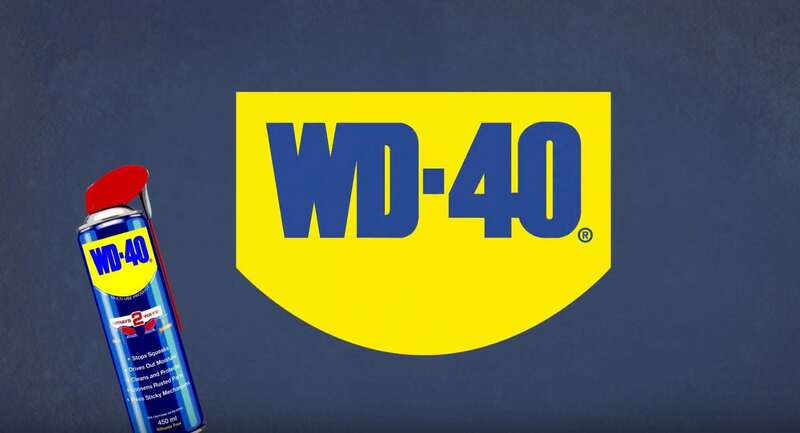 You can use WD-40 Multi-Use-Product. It is a water based lubricant that provides the right amount of lubrication to the chain lube. It has been the top choice of bikers for many years and has been keeping the chains of the bikes rolling for a long time. 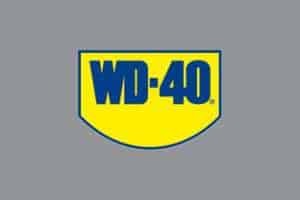 WD-40 is a great bike chain lube water based lubricant and will not only lubricate the chain well, but will also keep it rust and corrosion free. It also minimizes the accumulation of dirt which reduces the wear and tear of the chain. It is durable and stays on the chain for long allowing you to have the best riding experience for long. There are many people who go months and even years without cleaning and lubricating their bike chains, either because they do not have the knowledge or the time to do it. They may also be afraid that they might not be able to do it perfectly and hence don’t try it at all. 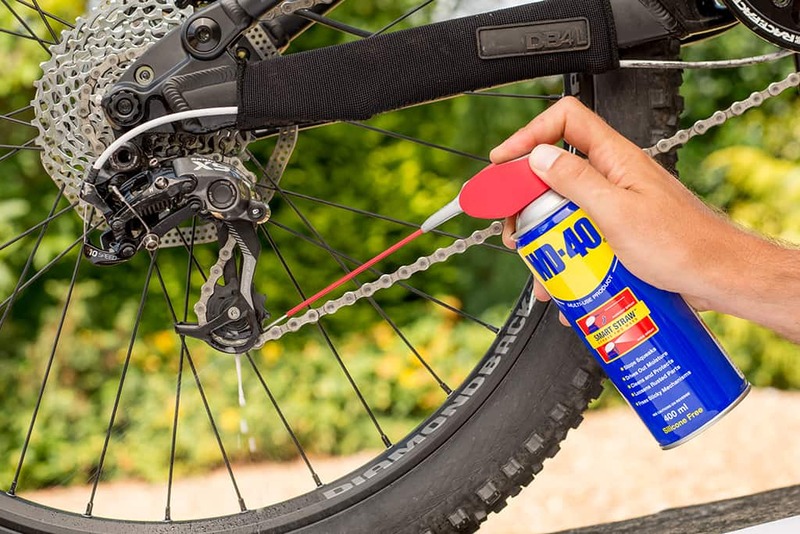 It is always better to clean the chain first before lubricating it, but if your friends are waiting outside tapping their feet and the chain is squeaky and dirty, it is still better to give the chain a quick spray of WD-40 than leaving it dry. Although it is better to do a complete cleaning, doing an easy and quick cleaning and lubrication is better than no cleaning and lubrication at all. The rollers and other components of your bike chain are in constant motion and therefore are subjected to wear and tear and also at the risk of rust and corrosion. It is important to check the bike chain for signs of wear, and also to check for chain stretch to keep it rolling effectively for long. Too much stretching of the chain can lead to damage of the gears. It is always better to replace the chain if it is beyond repair than to replace the gears as the gears are much more costly than the chain. Checking the chain for wear and tear and stretch will allow you to take proactive actions about your bike. It is important to keep your bike well-maintained if you want to keep it running for long. The most important part of the bike you need to maintain regularly is the chain. With the above-mentioned steps, you can maintain your bike chain well to and keep the bike running reliably and smoothly.